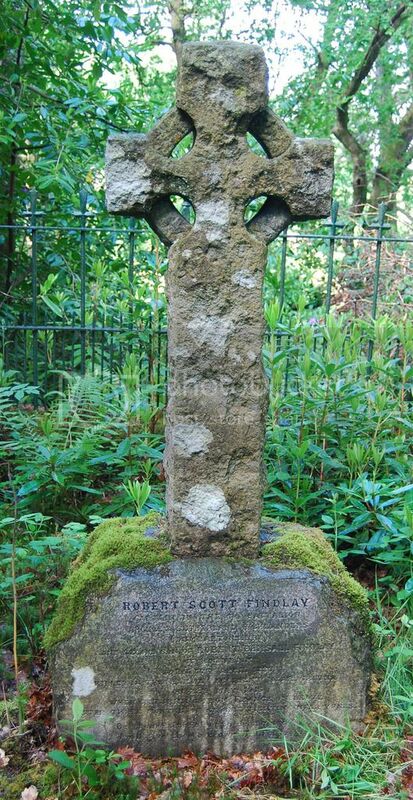 The Scottish War Graves Project :: View topic - Boturich Castle Private Burial Ground. Boturich Castle Private Burial Ground. Posted: Sun Jun 04, 2017 3:22 pm Post subject: Boturich Castle Private Burial Ground. This is in a wood in the Castle grounds, near the South-East shore of Loch Lomond. It belongs to the owner of the Castle. Access to the Castle Grounds and to the Private Burial Ground by kind permission of the owner. Correspondence Address: (Father) Major R. E. Findlay, Boturich Castle, Balloch, Dunbartonshire. Findlay, Robert Scott, Captain, 1/9th Battalion, Princess Louise’s (Argyll and Sutherland Highlanders) (Dunbartonshire T. F.), second son of Robert Elmsall Findlay of Boturich Castle, Dunbartonshire by his wife Jane Cecelia Louise, daughter of James Scott, 1 Woodside Place, Glasgow; born Glasgow 17th April 1887; educated St. Ninian’s, Moffat; Harrow (H. O. D. Davidson’s House, Elmfield), and Balliol College, Oxford, where he graduated B.A. in 1910; was afterwards on the staff of Messrs. Findlay, Richardson & Co., Lt., Merchants, Glasgow, Manila, Japan and China; went to Manila, Philippine Islands for his firm in November 1912, returning home on leave in June 1914; joined the 9th Battalion Argyll and Sutherland Highlanders as 2nd Lieutenant 28th July 1910; promoted Lieutenant 24th January 1913 and captain 16th December 1914; was still in England on leave when war broke out in August 1914; volunteered for foreign service; served with the 1/9th Argyll & Sutherland Highlanders in this country from 4th August 1914 and in France and Flanders from 19th February 1915; took part in the Second Battle of Ypres, when the battalion earned high praise from F.M. Sir John (now Lord) French; was three times hit by pieces of shell 10th May, but after a short visit to the Field Dressing Station in the evening, he returned to the fire trench, in command of a mixed company of the 2nd Camerons and the 1/9th Argyll & Sutherland Highlanders and held it until relieved the next morning and was killed in the railway accident near Gretna 22nd May 1915, while returning home on four days’ leave. A brother officer wrote: “He was the coolest man in difficulty or danger I ever met; he did splendid work for the regiment throughout and was certainly one of our best and bravest officers,” and another: “He was always cool, always seemed to know the right thing to do and did it; absolutely fearless, but never took an unnecessary risk or allowed any of his men to do so.” While at Harrow he was in the House Football XI in 1903 and in the School Shooting Eight in 1904 and 1905, when they were the winners of the Ashburton Shield. At Oxford, he rowed in his College Torpid, 1906, 1908 and 1909; in the College Eight, 1906 and 1909; shot in the University Eight, 1906 and 1909 and in the University Long Range Four, 1906, 1907, 1908 and 1909, when he was captain; was in the University Swimming Team, 1908, and in 1910 shot the Scottish Eight. Unmarried. Soldiers’ Effects: Captain R. S. Findlay, 9th Battalion, Argyll & Sutherland Highlanders. Killed in railway accident at Gretna, 22nd May 1915. Grantees: Robert Elmsall Findlay Esq., Robert Findlay Esq., Charles Bannatyne Findlay Esq., (jointly) George de Cardonnel Elmsall Findlay Esq., also Mrs Sarah MacAdam Potter. Findlay. 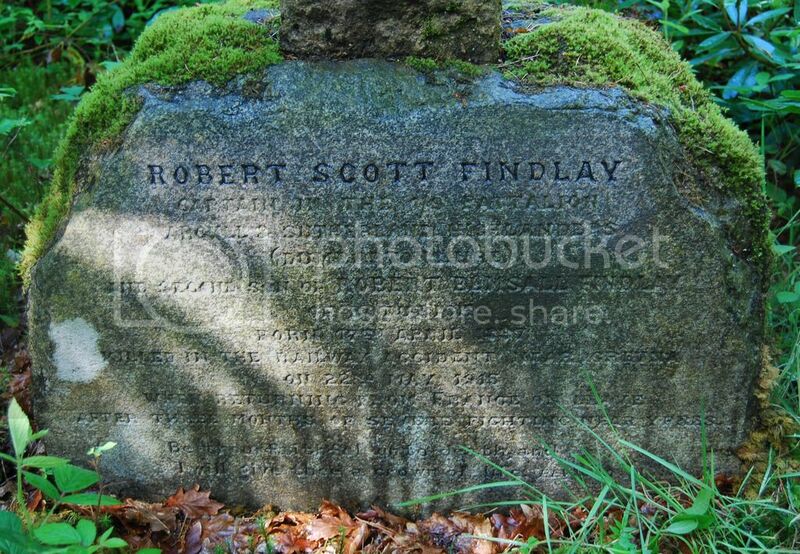 Killed in railway accident near Gretna on Saturday, 22nd inst., Captain Robert Scott Findlay, 1/9th Argyll and Sutherland Highlanders, aged 28, second son of Robert Elmsall Findlay of Boturich, Dunbartonshire. Military Funeral at St. Augustine’s Episcopal Church, Dumbarton on Wednesday 26th inst., at 2.50 o’clock. Friends please accept this intimation and invitation. After three months of service fighting near Ypres. The owner of Boturich said that the stone may be on the list for a bit of maintenance after a visit by Iain Anderson, Scottish CWGC Supervisor.